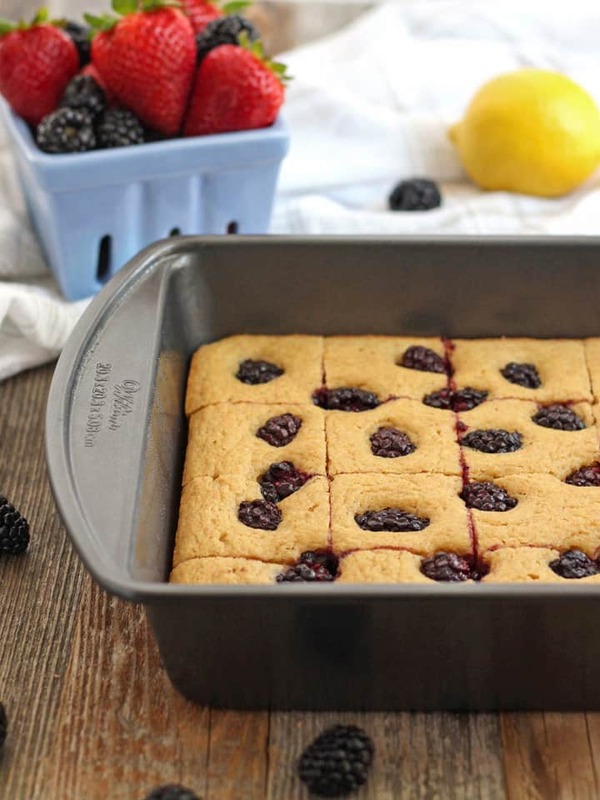 This Lemon Blackberry Baked Pancake makes breakfast almost too easy. Drop your spatula, skip the stovetop and enjoy a toaster oven baked pancake instead! Each bite filled with tangy buttermilk, bright citrus and tart fresh berries. 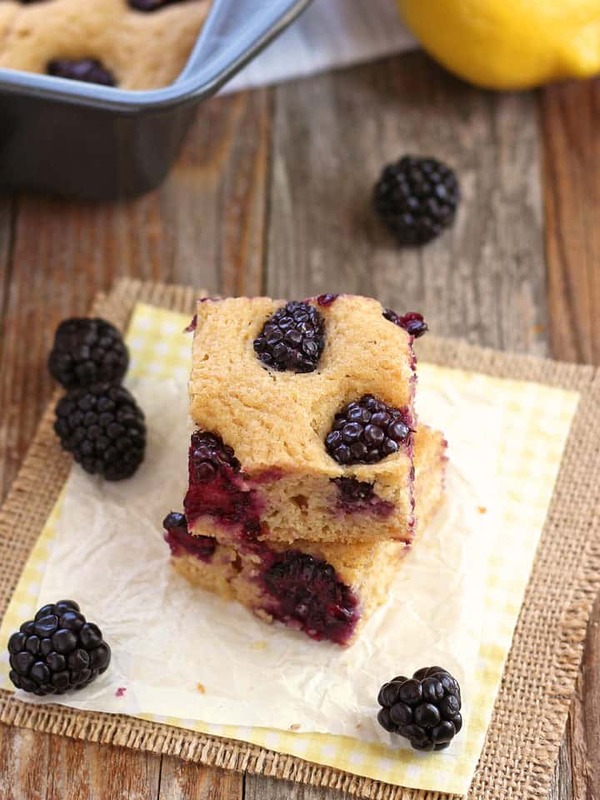 This Lemon Blackberry Baked Pancake is one of those little effort – big reward, keep it in your back pocket recipes. The kind of recipe where you can quickly mix all of the ingredients together, pop it in the toaster oven and TA-DA! A tasty breakfast magically appears. Yeah, we looove those too! Last year, I saw a recipe for an Oven-Baked Blueberry Pancake on Martha Stewart’s website and couldn’t wait to make it. But before you could say, “babe, where’s the maple syrup?” we hit a snag. See, the original recipe calls for the batter to be baked in a 10-inch cast iron skillet. We could never fit a skillet that size in our toaster oven. Even our biggest toaster oven, the Breville Smart Oven Pro (affiliate link) would be too small! Not ready to give up my dream of enjoying breakfast with everyone instead of flipping pancakes all morning I soldiered on. 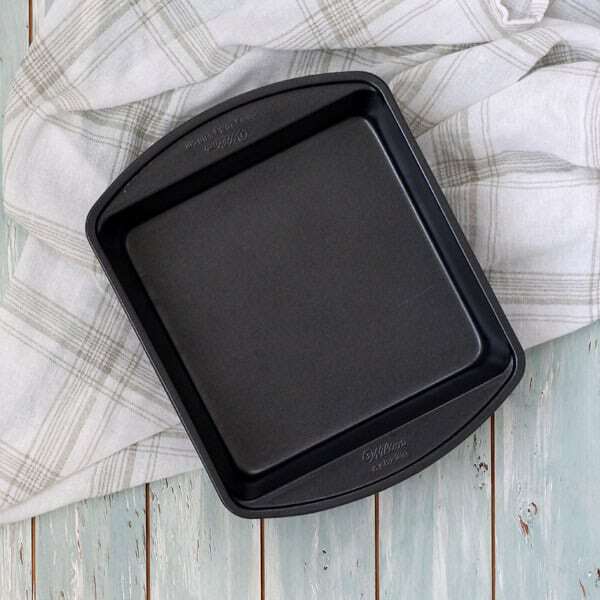 Well, it turns out this 8 x 8 metal baking pan (affiliate link) or an 11 x 7-inch baking pan like the one in this Chicago Metallic Toaster Oven Pan Set (affiliate link) is a pretty good substitute if you don’t have a 10-inch skillet. A metal pan is a safe toaster oven baking pan choice. 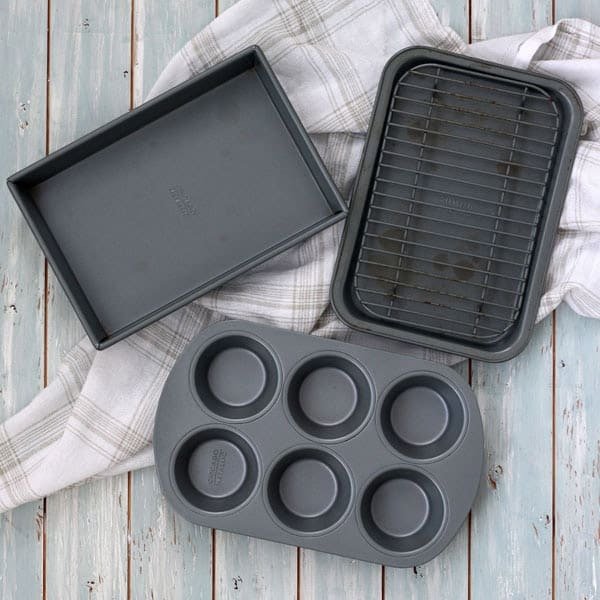 Much better than a glass baking dish which you shouldn’t use in a toaster oven. Plus it gives the best “Pancake Style” results = Golden edges with a tender fluffy center. For a fork and knife, sit at the table style breakfast you can serve the baked pancake cut into four large slices. Instead, we like to slice the “pancake” into 16 smaller squares. They’re a kid-friendly size that’s ideal for dunking in maple syrup! When my nephew was visiting last summer I made him mini blackberry banana breads and this blackberry lemon baked pancake. They were both a big hit. He just can’t get enough of that sweet-tart blackberry flavor. The lemony citrus and juicy berries pair perfectly with the honey and tangy buttermilk for a pancake that’s sweet but not overly sugary. For convenience, I’ve used frozen berries a few times. Although the berries sink more in the batter they hold up well and don’t get too soggy. 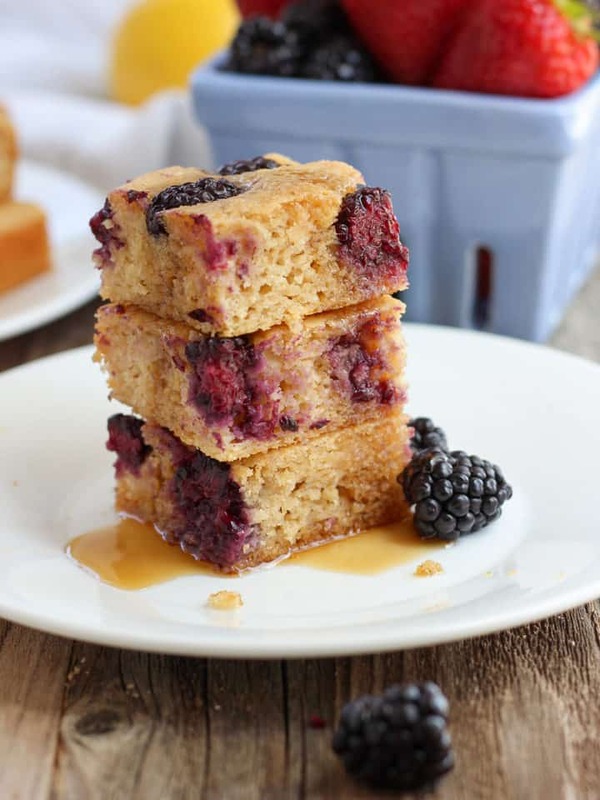 Berry season or not, you can enjoy this blackberry filled breakfast all year long! Pssst…this recipe is not for a Dutch baby which is sometimes referred to as an oven pancake. Dutch Babies are puffy with a custard-like center, this recipe is more of a baked pancake-cake situation. 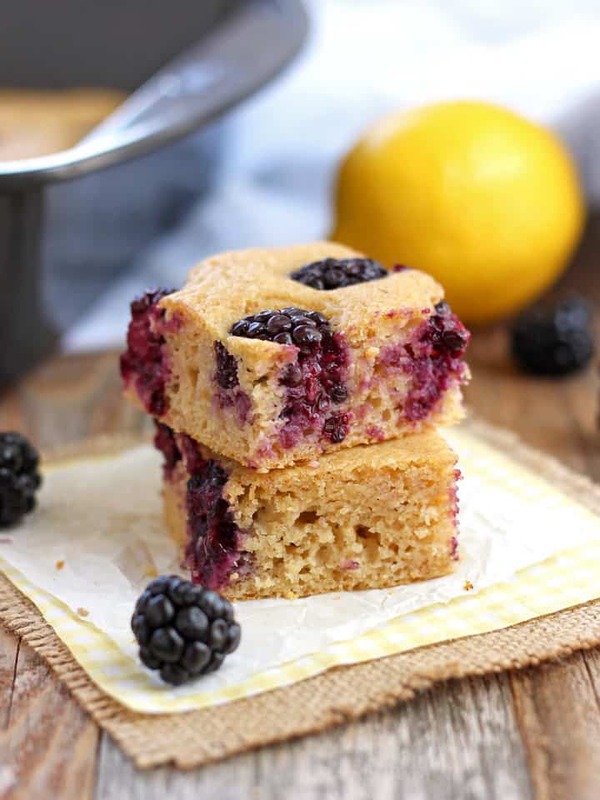 We also shared this Lemon Blackberry Baked Pancake Recipe on Food Fanatic, stop by to print out the recipe! 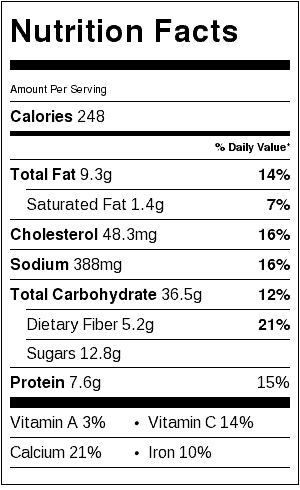 Nutrition information is an estimate for 1/4 of a baked pancake without any toppings. « Is Your Toaster Oven Lying About Its Temperature? Such a great recipe, exactly to my taste. And I love the pictures, they are so pretty. I hope to get a chance to make this soon (with frozen berries, can’t touch the others this time of the year, they are sooo expensive). I have never seen or heard about baked pancake. We have a combination and I haven’t used much other than heating pizza or baking fish. This will be a great recipe to try. Thanks for sharing your love for toaster oven. Thanks for stopping by Balvinder! I hope you enjoy the pancake, we have some readers who would love to hear if you make a gluten-free version. Meal prep / freezing them is such a great idea Bethany because YAY for weekday pancakes!! i do love pancakes, but they can be a pain to make, especially for a person as impatient as i am. great idea, and great additions!